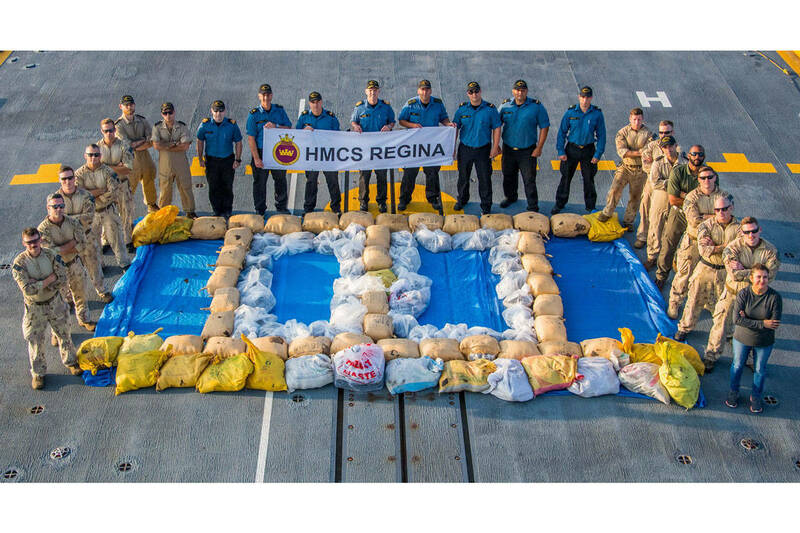 Suspected drug traffickers operating in the Caribbean Basin and the east Pacific Ocean recently faced a mighty effort to clamp down on their clandestine work, thanks in part to HMCS Protecteur. The supply ship returned home to HMC Dockyard in Esquimalt today (June 30) after being away at sea since February. Over the past month Protecteur provided refuelling services to ships taking part in the U.S.-led multinational initiative. Since April, the floating anti-narcotics task force netted 33 arrests and 12 tonnes of cocaine, worth an estimated $235 million on the street. Prior to that the vessel participated in a warfare training exercise in the Strait of Juan de Fuca, and sailed in Hawaiian waters as part of the U.S. Navy’s submarine commanders’ training program early in the year. “Since February, Protecteur has sailed nearly 22,000 nautical miles and completed multiple replenishment-at-sea operations for 16 different ships, transferring almost 18 million litres of fuel,” said Cmdr. John Tremblay, commanding officer of HMCS Protecteur.